By Anna Monus in WordPress. Updated on September 4, 2018 . Building accessible websites that don’t exclude people with different kinds of disabilities has become more of a requirement in web design in the recent years. These days it’s hard to get a government contract without taking care of digital inclusivity, and many well-known companies such as Microsoft, Apple, and Google also treat accessibility as a priority. WordPress as a leading content management system and blogging platform is on the frontline of accessibility development as well. The WordPress A11y (Accessibility) Team is busy making the platform available to as many people as possible, and they have even published a great Handbook on WordPress Accessibility for developers. The accessibility review is an optional stage in the WordPress theme review process. If a submitted theme uses the accessibility-ready tag, the review team will check it against the accessibility guidelines to ensure that themes promoting themselves as accessibility-ready are really so. In this post we will take a look at the 10 best accessibility-ready WordPress themes to help you build digitally inclusive WordPress sites. In this collection we did not only pay attention to whether a theme had the accessibility-ready tag in the WordPress repository, we also took into consideration whether it met the main principles of accessibility design. We omitted some (otherwise great) themes that used too low colour contrast ratios, hamburger menus on desktop size or other visual design practices that may affect accessibility for certain groups of disabled people. 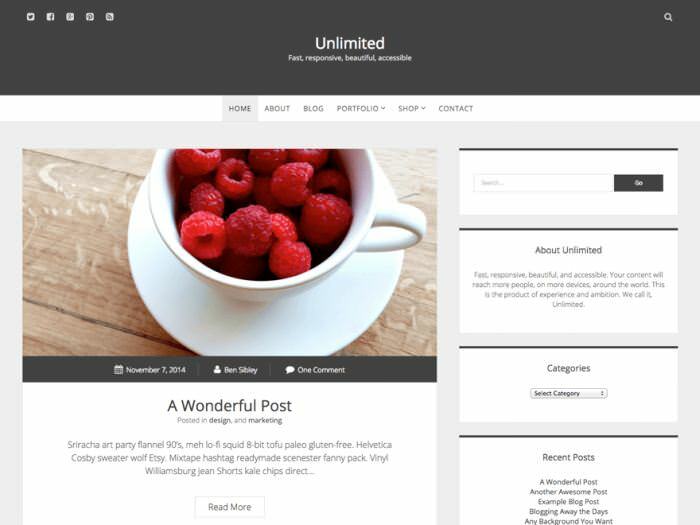 Unlimited is a carefully designed, general purpose WordPress theme with a right sidebar. It loads quickly and uses a high colour contrast ratio (white & light gray versus dark gray) that matches the needs of visually impaired users. The sidebar widgets are smartly highlighted by dark gray top borders. Subtle visual design elements help users to quickly make sense of the content; just take a look at the smartly emphasized meta information (date, author, number of comments) at the bottom of the featured image at each post. On its demo site you can see how Unlimited looks like when it’s fully set up. Simone has a quite straightforward design with huge images and screen-focused, scalable typography that is easy to read on every screen size. The theme helps physically disabled users access navigation via their keyboards. 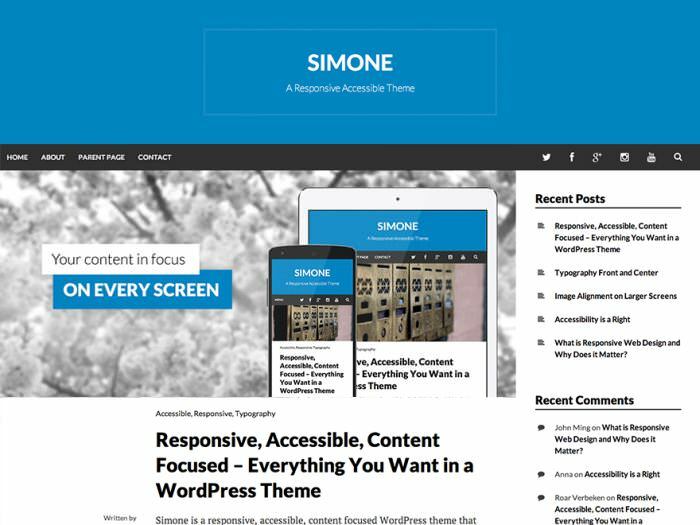 Read more about Simone on its demo site. Accessible Zen is a minimalistic, one-column theme that reduces the number of distractions as much as it’s possible, and puts the content in the focus. The author shared on his blog the colour palette he used. It meets the AA level of the Web Content Accessibility Guidelines (WCAG 2.0). 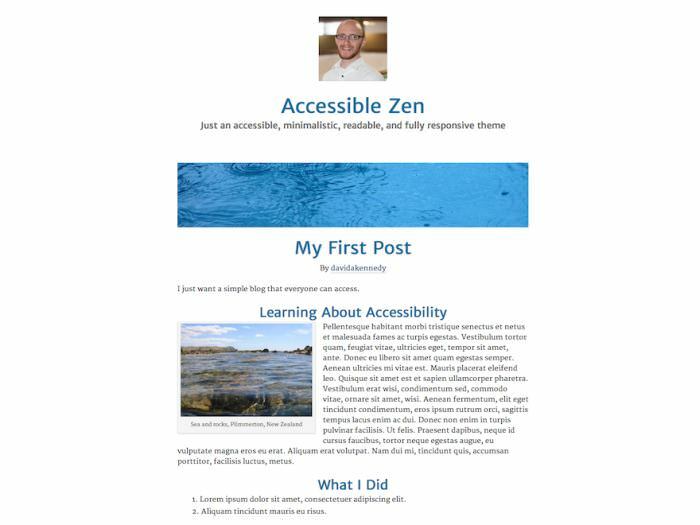 If you are interested in a content-focused, minimalistic blog theme, check out Accessible Zen live. 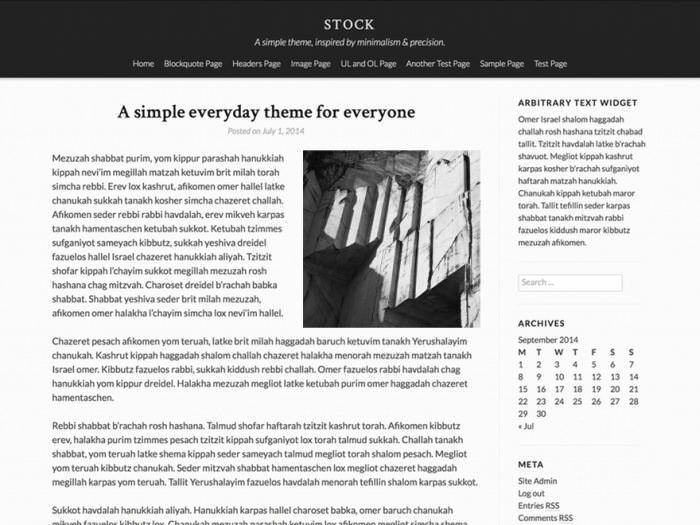 The Stock WordPress theme has an elegant black and white header that includes a centered main menu . Pairing black and white is always a great choice for accessibility-ready sites, as these two colours have the highest colour contrast ratio which is 21:1. The design is quite minimalistic, and the theme is translation-ready and offers RTL (right-to-left) language support, so it can be a good canditate for being a parent theme of an accessible child theme. You can check out the current stage of the development on Stock’s Github page. Apex engages visitors with a logically structured content and huge featured images that make the site look impressive and professional. The top navigation consists of a main menu on the left hand side, and a social media menu on the right, which makes it easy and straightforward to navigate through the site for both disabled people and assistive devices. The excerpts on the home page are followed by user-friendly "Continue reading" buttons that are beautifully highlighted and entices readers to go on. You can see how Apex looks like on its demo site. It took no less than 9 months for the author of the Tiny Framework to create this engaging, accessibility-ready WordPress theme. 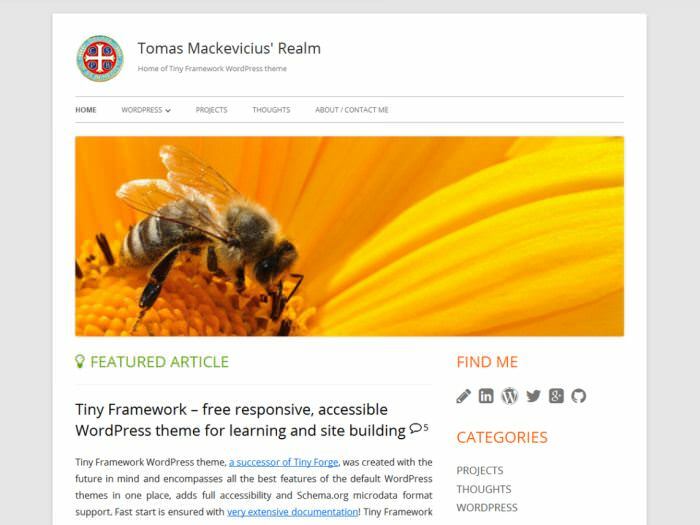 The Tiny Framework is flexible enough to be used as a parent theme if you want to quickly develop a reliable child theme that pay attention to the needs of disabled people. The Tiny Framework theme uses a high contrast colour palette with black, orange and green colours. Blockquotes, headings and links all have different colours, which increases the legibility of the content in a significant way. Buttons are also easily noticeable, and the theme overally has a quite energetic and vivid look, but not in the obtrusive way. Kuorinka loads really fast and doesn’t only offer accessibility support but also includes schema.org microdata. It uses breadcrumbs to support the main navigation, which is always a good idea in accessibility design. Kuorinka allows the user to add short information to the top of the page that can help visitors understand the most important message the site owner wants to convey. The headings of the sidebar and the footer widgets are highlighted with a light-blue background that greatly helps the visual segmentation of the content. On the demo site you can see other cool features such as a user-controlled slider, 3 different layouts (one column, left sidebar, right sidebar), and many others. 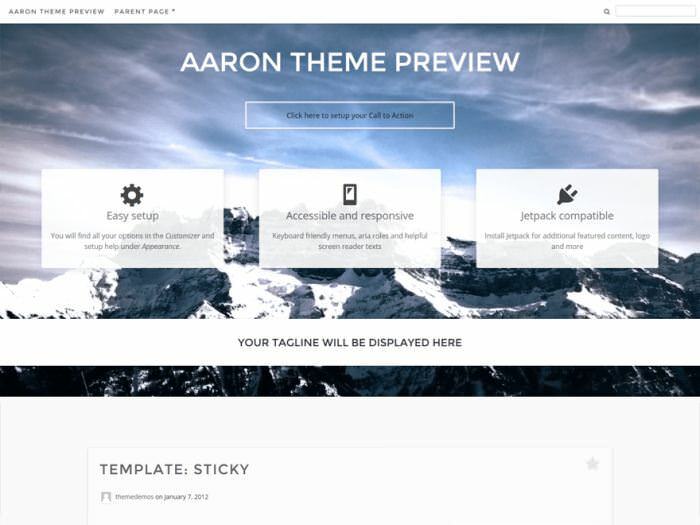 Aaron is a great choice for an accessibility-ready company website. It has a huge call-to-action button on the home page that grabs the visitors’ eyes at once. The theme has a high colour contrast ratio, but you need to pay attention to carefully choose the background image on the home page to keep the readability of the highlights and the buttons. Aaron has a keyboard-friendly menu on the top of the site that is supported by a handy search box on the right hand side. 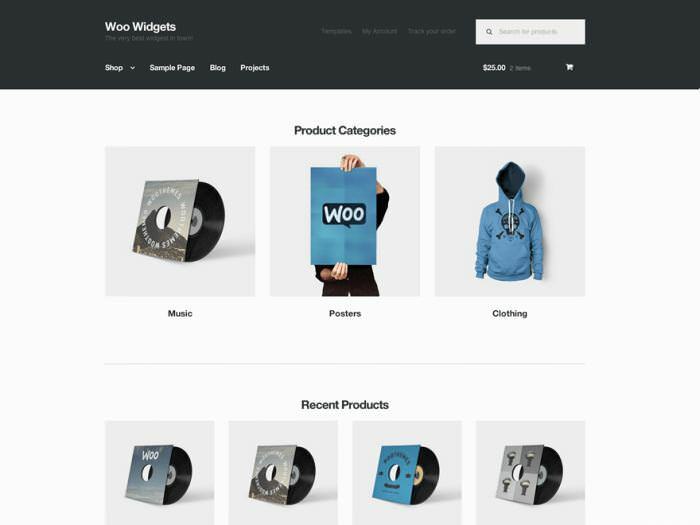 The theme can be used for an e-Commerce site as well, as it works well with the WooCommerce plugin. Storefront is a flexible e-commerce theme offering WooCommerce integration and high customizability. The most important information, the purchased products in the cart and their prices, are right next to the main menu on the top of the site which makes the theme incredibly user-friendly. On the demo site you can see the optional header image that contains a highly visible call-to-action button. The products are assorted into different categories that helps disabled visitors using screen readers and other assistive technologies quickly understand what is on sale on the site. 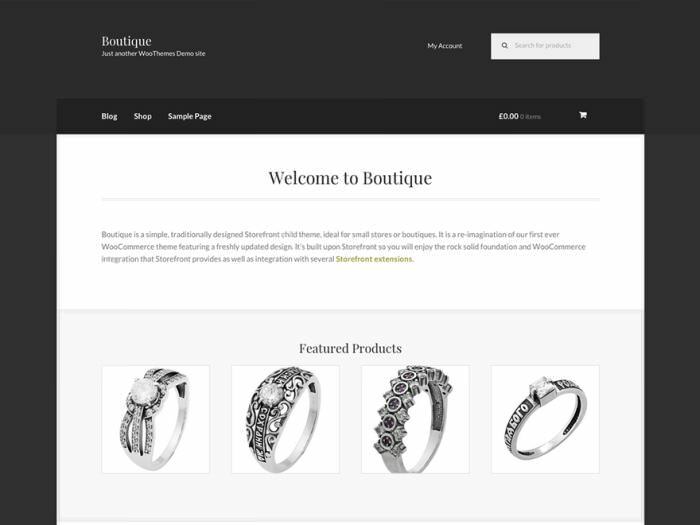 Storefront has an elegant child theme called Boutique for featuring more prestigious products that also has accessibility support. 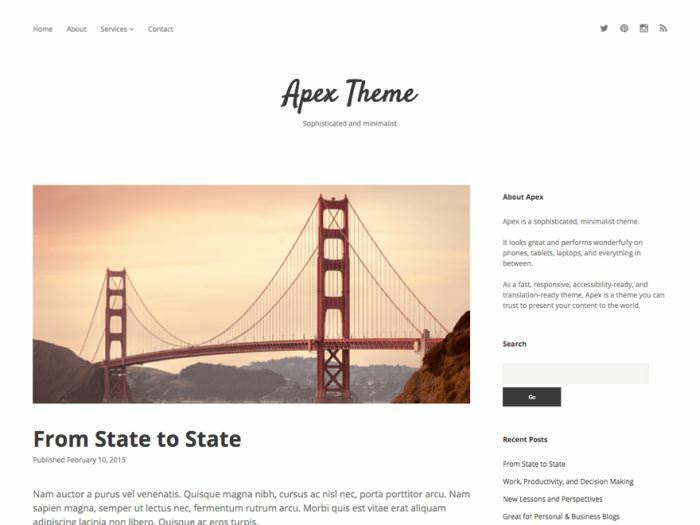 Author is a beautifully designed, fast and accessibility-ready WordPress theme with a left sidebar. The sidebar uses a dark background with white letters, which ensures the high colour contrast ratio. The hyperlinks are underlined so it’s easy to recognize them. The headings use a serif typeface that facilitates readibility. 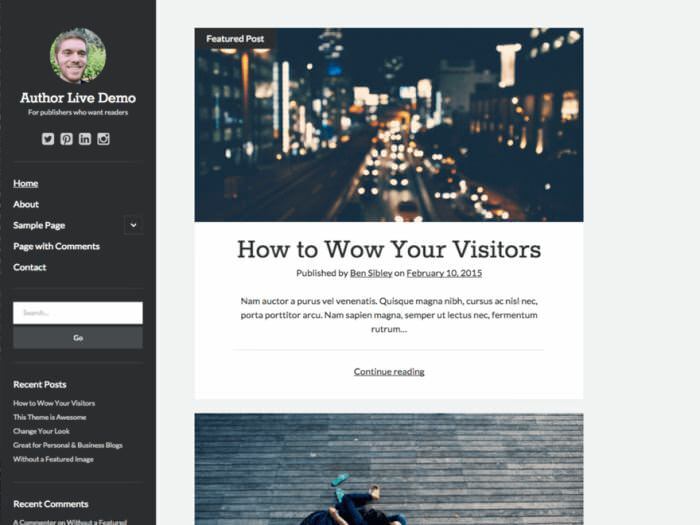 On the single post template the previous and next posts are highlighted with a light gray background that encourages users to read more posts on the site.